3d or not 3d? that is the question. It is so true Beth – once experiences are lived, they are no longer discrete but rather become integrated through-out our entire understanding – much as the molecules of nutrition in our breakfast end up dispersed though-out our physical systems. Thought provoking post. Thank you Beth. I’ve never been to a 3d movie but I have tried on those cardboard glasses. Gave me a headache. I wish I could watch 3D but I get such a headache from the movies, no matter how far technology has come. My first real 3-D experience was with some comic books that were a fad in the latish 80s. I did see an actual classic black-and-white movie in 3-D, though, thanks to campus cinema. The surprising thing about 3-D in my experience has been that it’s much better at depth than it is at projecting things out of the screen. thanks, beth! probably will become totally wild…WILD! 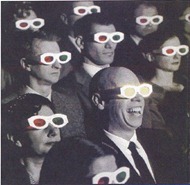 Sound like a blast at the movie theater; I’ve never been a fan of those 3D glasses, they’re way too flimsy.